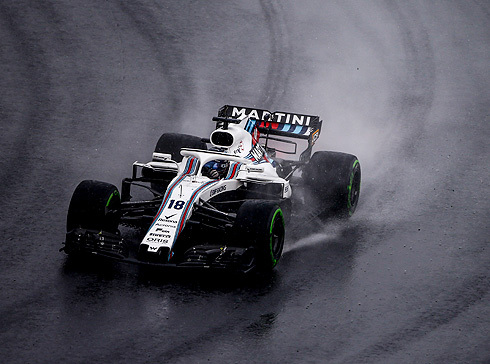 In what was a session dominated by changing track conditions with rain falling the Williams Martini team would come away disappointed with the results of qualifying for the 2018 Hungarian GP. 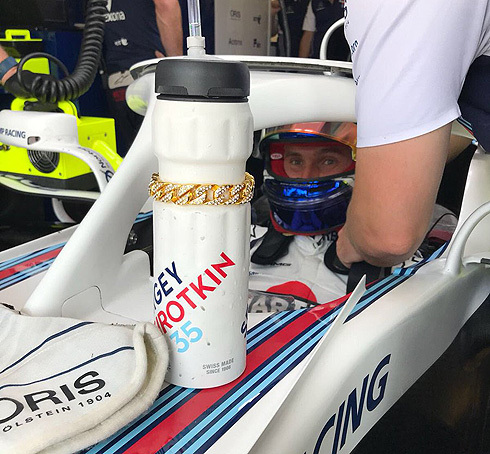 At the end of the session the Williams drivers Lance Stroll and Sergey Sirotkin would finish in 15th and 20th with Lance leading. It was a session that came down to been on the right tyre at the right time and Sergey especially would struggle to get the best from the tyre he was on primarily due to traffic. Lance was able to get into the second period but would spin and crash his car into the barrier forcing him to pit ending his session without having set a time in the second period. Qualifying for the 2018 Hungarian GP would see the session start with a wet track with rain haven fallen even though it had eased prior to the start of the session. With clouds overhead the opening eighteen minute period would see a rush of drivers coming out all on the intermediate tyre. But if the track dried they would be stopping to change tyres very quickly. Times would start to be set with Raikkonen been fastest with a 1m:25.988 followed by Hamilton, Hulkenberg, and Bottas. Vettel was now second ahead of Hamilton and Hulkenberg. The Williams drivers were now 19th and 20th as Verstappen went 6th. Sainz was seventh followed by Alonso, Hartley and Magnussen tenth. Vettel was staying if there was no rain they were close to changing to dry tyres. And several drivers were n changing to the ultrasoft tyre. Ricciardo was now third followed by Verstappen, Hamilton, and Hulkenberg sixth. With the dry tyres now been sued Magnussen would go fastest with a 1m:22.476 but Hulkenberg would go quicker with a 1m:21.729. 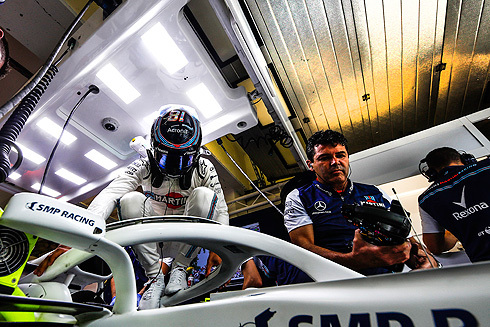 The Williams drivers would go fifth and sixth fastest but would quickly drop down the times. Sainz was now quickest with a 1m:19.642 but Raikkonen would move ahead with a 1m:18.474. Bottas was now second but Verstappen would take this spot. It was all changing rapidly with Grosjean now second from Verstappen. Both Williams drivers had pitted and would return o nrw ultrasoft tyres. Raikkonen was now quickest with a 1m:17.526 from Vettel, Verstappen, Bottas, Grosjean, Sainz and Gasly. The positions were rapidly changing as Hamilton went quickest. Both Williams drivers were on quicker laps but their laps would see them 10th and 18th. The top ten would be Vettel from Verstappen, Bottas, Hamilton, Raikkonen, Sainz, Grosjean, Hulkenberg, Alonso and Magnussen in tenth. So we would have one Williams make it into the second period. This was a real hectic opening period with huge changes as the track improved during the period. With the start of the second period there would be a rush of drivers coming out all on the ultrasoft tyre except Vettel who was on the intermediate tyre. But after a lap drivers would return to the pits looking to change to the intermediate tyre as the track was again wet in places. A 1m:28.636 from Vettel with the track now very wet. 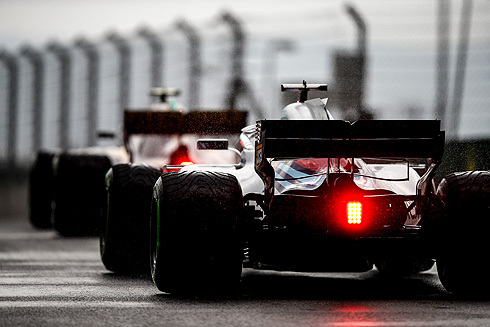 The conditions were expected to worsen with Sainz now second from Verstappen, Hamilton, Gasly, Bottas, Hartley, Raikkonen, Magnussen and Grosjean tenth. Magnussen was out on the full wet tyre joined by Ericsson. Raikkonen would spin at the chicane seeing him pit. He would be joined by the majority of the field with only Hulkenberg and Ericsson on the track. More drivers would try the full wet tyre but they would not go any quicker with the top ten ending up been Vettel, Sainz, Verstappen, Hamilton, Gasly, Bottas, Hartley, Raikkonen, Magnussen and Grosjean. The final period would see all the top ten come out on the full wet tyre such were the conditions. After the opening laps it would be Hamilton fastest with a 1m:37.564 from Bottas, Raikkonen, Verstappen, Sainz, Vettel, Hartley, Magnussen, Grosjean and Gasly. A 1m:36.648 from Hamilton as Vettel would move up to third and Gasly was now fifth. Raikkonen was now second followed by Bottas and Vettel. Bottas would move up to second with Raikkonen now third. But Raikkonen would go quickest with a 1m:36.186. Sainz was now fifth from Gasly and Verstappen. As driers continued to put in laps Sainz would move up to third with Hamilton second. Several drivers had pitted coming back out on new wet tyres. Vettel would move up to second but Bottas would go fastest with a 1m:35.918 but Hamilton would move ahead with a 1m:35.658. So Hamilton would take pole from Hamilton, Raikkonen, Vettel, Sainz, Gasly, Verstappen, Harley, Magnussen, and Grosjean tenth. With the end of qualifying the Williams team would see their drivers finish in 15th and 20th. Lance would also come out on the intermediate tyre for the first period. His first lap would see him set a 1m:30.434 dropping to 19th. He would pit and Lance was also back out now on the ultrasoft tyre and would go sixth with a 1m:23.136 but would quickly drop to 14th. lance would set a 1m:21.864 to be 12th as he pitted. he would return on new ultrasoft tyres. Lance would set a 1m:18.560 to be ninth. He would drop to tenth as the period ended. This would become 13th as others completed their laps. For the second period Lance would come out on the ultrasoft tyre but would pit for intermediate tyres. Lance would go off at Turn nine taking off his front wing. He was able to continue but was forced to pit. Lance had not set a time with five minutes remaining. Lance would not return and would be out of qualifying. First out for Williams would be Sergey following others in using the intermediate tyre. Sergey would set a 1m:30.774 dropping to be 20th. Sergey would pit but he would return now on the ultrasoft tyre and would set a 1m:24.479 to be fifth but he would drop to 16th. Sergey was now 20th and would pit. He would come back out on new ultrasoft tyres. Sergey would set a 1m:19.301 but this would see him drop down to 18th. He would finish the period in 20th and out of qualifying. Sergey would come across as very frustrated in his post session interview.